Although blood transfusion can be done today with high security, is not without risks, the main one being transmission of infectious diseases (AIDS, hepatitis B and C, syphilis). It is also well known the shortage of treatment resources (allogeneic blood in blood banks). That is why in recent years autotransfusion programs and measures to reduce intra and postoperative bleeding have been developed. In the Hospital 9 de Octubre we have established a comprehensive bloodless surgery program (CSS program) whose main objective is to avoid allogeneic blood transfusion, using all means, resources and personnel which modern medicine puts at our disposal. Minimising the demand for blood from the blood bank, reserving it for cases that require it (oncology, critical emergencies, etc.). Promote appropriate care to patients who for religious or other not wish to be transfused with allogeneic blood (Jehovah’s Witnesses). 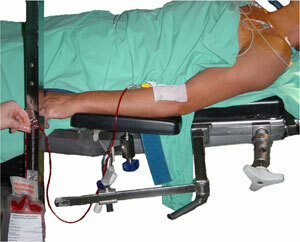 There are several measures which, toghether, reduce the need for transfusion. Optimum preparation of the patient to obtain adequate amounts of haemoglobin and red blood cells. During the preoperative visit iron treatment is prescribed until the day of surgery. Reduced bleeding: bleeding in surgical techniques (endoscopic techniques, minimally invasive surgery, microsurgery). Equipment and surgical devices (electrocautery, bipolar coagulator, ultrasonic aspirator, heat sealing, endoclips, Spongostan, Tissucol, Surgicel). Pharmacological measures to reduce blood loss (hypotension, etc). Autotransfusion Program: these are procedures for the extraction and storage of blood or blood components to a donor-patient for subsequent transfusion to the same person at the time of need. The Haematology Department is responsible for the procedure predeposit. The other techniques are developed in the operating room and are the responsibility of the Department of Anaesthesiology and the various surgical services. Eliminates the risk of transfusion reactions. Eliminates the risk of transmission of infectious diseases. Eliminates the risk of alloimmunization to red cells, white, platelets and plasma proteins. Eliminates the risk of graft versus host disease. Useful in patients with multiple alloantibodies or rare blood groups. Lowers the number of postoperative infections. Meets the need of blood in some Jehovah’s Witnesses. Hemodilution improves oxygenation of the tissues by reducing blood viscosity. Reduce the demands on the blood supply in times of shortage. Psychological effect of patient participation in treatment. Requires expert preparation of the specialists involved directly in the performance of each technique. Each technique requires particular equipment, which is not present on a regular basis in all hospitals. Predeposit consists of the collection of one or more units of blood in the patient candidate for surgery in the weeks leading up to it, if there are no contraindications to doing so. If the patient’s hemoglobin is low, we will evaluate the possible use of erythropoietin (rHuEPO), a substance that stimulates the formation of blood. These blood units are stored as predeposit in the Blood Bank properly identified. If the patient-donor needs a transfusion during or after surgery, he receives his own blood, donated previously. This consists of obtaining in the operating room, just before surgery, a blood volume, compensated by adequate infusion of a given volume of fluid. The anaesthesiologist removes a number of bags of whole blood (between 1 and 4) which are available to be reinfused when the patient needs it. As a result, the patient’s blood is diluted, so that the net amount of haemoglobin lost during surgery is minor. At the end of surgery, when surgical bleeding has been controlled the blood obtained at the beginning of surgery is again reinfused. The fact that the vast majority of patients are candidates for ANH, low cost and the requirement of little manipulation technique, make the ANH technique is very affordable and practical. Intraoperative recovery (IAT or Intraoperative Auto-Transfusion). It is recognized as the standard method of intraoperative autotransfusion, particularly very useful in surgery intraoperative bleeding (eg, total hip, lumbosacral arthrodesis). It consists of collection of blood from the operative field, which is aspirated and led into a reservoir. Under standard conditions the red cells are separated, washed hemoconcentrated and stored in a bag, ready to be reinfused to the patient. The procedure requires special apparatus. The Surgical Area in Hospital 9 de Octubre is equipped with a modern Cell Saver-5, which allows not only the recovery of red cells, but also, in specific cases, other blood components, using specialized equipment to do so. The procedure is performed by the anaesthesiologist responsible for the patient. Since there is no connection at all times between the surgical fields – vacuum – recovery – blood bag – Infusion System – patient, there is no possibility of error as to confusion of identities between the patient and their bags of packed red blood cells. It consists of the collection of blood lost through drains in the early hours after surgery. The procedure requires a special drainage bag known as autotransfusion. The blood recovered, in bags, passes through special filters in order to be reinfused later. This technique allows the recovery of whole blood. These procedures are more effective the higher the baseline haemoglobin. Ideally, haemoglobin at baseline (before surgery) should be above and not exceeding 12g/dL 17g/dL. To support the achievement of this haemoglobin, we recommend prophylactic oral iron intake in all patients. In special cases (anaemia) may also consider the administration of erythropoietin (rHuEPO), a substance that stimulates the formation of blood cells, thereby increasing the net amount of haemoglobin. In the case of predeposit the criteria for drug administration will be individualized for each patient and the decision will be taken by the haematologist who performed the extractions. Surgical techniques to reduce bleeding, the optimal patient preparation, intraoperative hemodilution (ANH) and intraoperative recovery are accepted by the criteria of Watch Tower. It may also be eligible postoperative recovery. The predeposit is not admissible in any case. Intraoperative ANH and recovery are acceptable to most Jehovah’s Witnesses, subject to compliance with the recommendations of Atalaya and the patient’s request. Special alternatives are offered on a separate document that describes each of the strategies, processes and products or components and allowed according to the latest data available from the Watch Tower.